Croatia’s coastline is flanked by more than a thousand islands. Offering a wealth of recreational, historical and natural value, the redeeming qualities of these islands seemingly have no end. Roman ruins? Check. Abandoned Yugoslavian submarine pens? Check. Adrenaline pumping cliff diving? Check. Glamorous beachside clubbing? Check. There is an island perfectly matched for anyone’s personality and travel style. 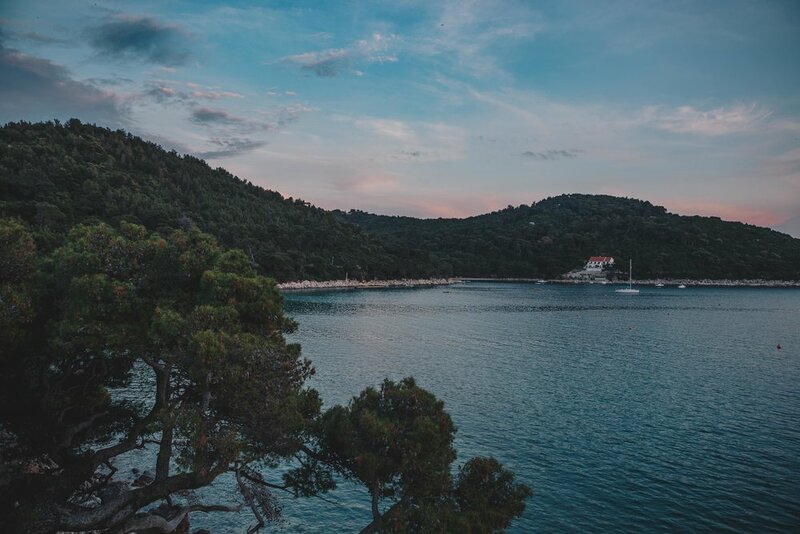 The island we chose was Mljet, known for its densely forested national park, gorgeous blue saltwater lakes and relative lack of tourists compared to some of its more populous counterparts. Setting off from Dubrovnik, we reached the island via a car ferry that we had booked ahead of time. After feeding our newfound addiction to octopus salad and grilled squid at a seaside village near the ferry landing, we drove to the eastern-most part of the island (Saplunara) and checked in to our accommodation. The Guesthouse was tucked into a natural bay dotted with sailboats and sandy public beach areas. It was pretty apparent that the next couple of days on the island were going to be just our speed. We bought some basics at the market next door and ate a homemade dinner with the view above as a backdrop.